If a Lead does not want to book you, the shoot can be removed from the Leads section in two ways. First, navigate to the Overview section of the shoot and click "Lead" in the upper right corner to select your options. In most cases we recommend you use the Mark as Dead option, as you will retain the original information for the job in case you should need to access it down the road. When you Mark a Lead or Shoot as Dead, it will be removed from your active shoots but it will be archived under Shoots > History > Dead Leads and can be easily restored as a Lead with a click of a button. All of your data for the shoot (i.e. relationships, locations, remarks, etc) will be preserved. You will also have the option to define the Reason the cancellation occurred. To restore a Dead Lead navigate to Shoots > History > Dead Leads. 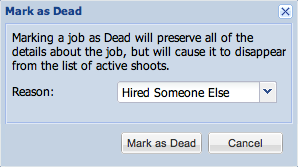 On the Overview page of the shoot click "Dead" in the upper right corner and select "Restore As Lead". This will move the shoot back to the Leads section under the Shoots tab. 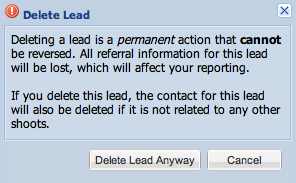 Deleting a Lead or Shoot is a permanent action that will remove all associated information for that job and will also delete the main contact's name from your Relationships database, unless they happen to be attached to another job as well. This option is only recommended if you are needing to delete a mistakenly created, duplicate or test job. The Cancel Job option only applies to booked shoots, not leads. You can cancel a booked job by clicking "Booked" in the upper right corner of the shoot's overview page. Then select "Cancel Job" to remove it from your active booked shoots. Your data for the shoot will be preserved and the shoot will be archived under Shoots > History > Canceled Jobs. Any Paid Invoices will still reflect in your reports and profit figures. Any unpaid invoices will be marked "Void" and will not factor into reporting. A canceled job can always be reinstated as an active shoot by navigating to the shoot's overview page and clicking "Booked" in the upper right corner. Select "Restore as Booked" and the shoot will then be moved to the Booked shoots section under the Shoots tab. All past due and pending invoices will be become active again. Does ShootQ create estimates / quotes?